William James Chapman was born in Yeovil at the beginning of 1898, the son of groom and gardener Charles Chapman (1870-1949) and Frances 'Fanny' née Gillingham (b1869). In the 1901 census Charles and Fanny were listed at 48 Huish with their three children; Reginald Charles George (b1896), three year old William and Francis Hilda Victoria (b1901), together with Fanny's mother, widowed Caroline Hobbs. By the time of the 1911 census the family had moved to 126 Huish and had another daughter, Ivy Gertrude (b1905). Charles gave his occupation as a jobbing gardener while 13-year old William worked as a printer's errand boy. On 25 September 1916, at the age of 18, William enlisted in the army at Yeovil. Initially he served as a Private in the Cambridgeshire Regiment with Service Number 8220. He was very soon transferred to the 1st Battalion, Queen's Own (Royal West Kent Regiment) with the new Service Number 242413. William, by this time promoted to Lance-Corporal, was sent to France to join his regiment at the Front and, within three weeks he was involved in the Battle of Broodseinde. This was part of the middle phase of the Third Battle of Ypres. The Battle of Broodseinde was a large operation, involving twelve divisions attacking simultaneously along a 10 km front. It was fought on 4 October 1917 near Ypres in Flanders, at the east end of the Gheluvelt plateau, by the British Second and Fifth armies and the German 4th Army. The battle was the most successful Allied attack of the Battle of Passchendaele. Using "bite-and-hold" tactics, with objectives limited to what could be held against German counter-attacks, the British devastated the German defence, which prompted a crisis among the German commanders and caused a severe loss of morale in the German 4th Army. Both sides were planning an attack on 4 October. When the British bombardment began, it caught a number of German units out in the open preparing for their own attack. The British attack contained divisions from Britain, New Zealand and Australia. As at Menin Road Ridge and Polygon Wood, the British attack achieved its main objectives and then halted to dig in. Although Broodseinde is often described as small scale battle, the casualty figures demonstrate the real scale of the fighting. The Germans suffered 10,000 casualties and lost 5,000 prisoners. On the Allied side the Australians suffered 6,432 casualties, the New Zealanders 892 and the British 300. The battle was recorded as a “black day” in the official German history of war. 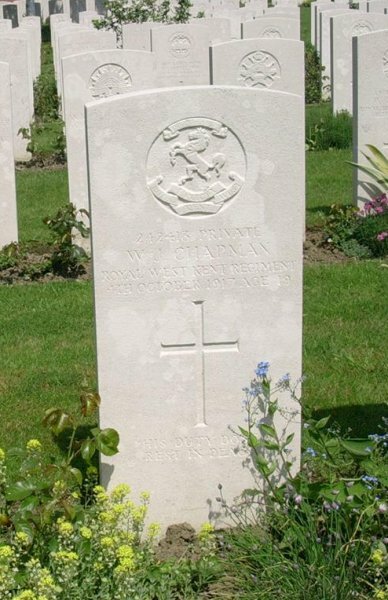 William was initially listed as missing in action but it was later confirmed that he was killed on 4 October 1917. He was just 19 years old and had been involved in the war for just three weeks. In its edition of 30 November 1917, the Western Gazette reported "Mr and Mrs Chapman, of 126 Huish, have received a notification to the effect that their son, Lance-Corpl. William J Chapman, of the ---- Battalion, Royal West Kent Regiment, has been missing after an engagement on the 4th October. Lance-Corporal Chapman, who was in his 20th year, joined up on September 25th last year, and had been three weeks in France. Another son, who joined on the outbreak of war is now in India." 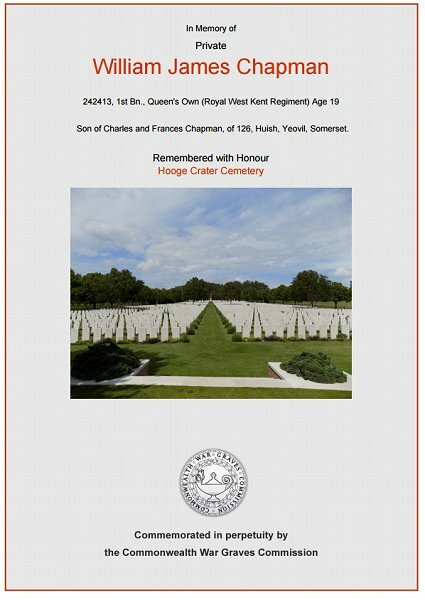 William Chapman was interred in Hooge Crater Cemetery - Grave IV.J.10 - and his name is recorded on the War Memorial in the Borough. The Commonwealth War Graves Commission's certificate commemorating William Chapman.